Even with the best pretreatment programs, boiler feedwater will contain some degree of impurities, such as suspended and dissolved solids. These impurities can accumulate inside the boiler over time. The increasing concentration of dissolved solids may lead to carryover of boiler water into the steam, causing damage to piping, steam traps and even process equipment. The increasing concentration of suspended solids can form sludge, which impairs boiler efficiency and heat transfer capability. To avoid boiler problems, water must be periodically discharged or “blown down” from the boiler to control the concentrations of suspended and total dissolved solids in the boiler. Sterling’s Blowdown Tank receives blowdown from the steam drum and steam generator. 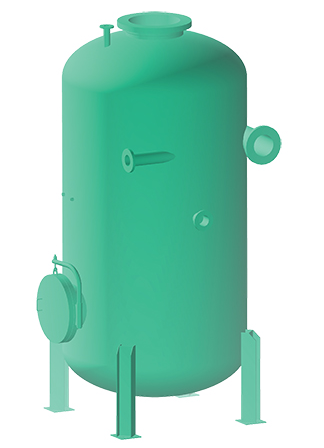 Sterling’s Blowdown Tank can also function as a gravity feed drain for the steam generator, when the generator is drained for maintenance. In Sterling’s design, flashing water enters the tank tangentially where centrifugal action separates the liquid from vapor. Flashed steam exits through a nozzle in the top of the tank, while the liquid is drawn from the bottom of the vessel. All steam boilers must be blown down to reduce the amount of total dissolved solids in the boiler water. However, along with the solids, thermal energy is lost. Sterling’s Blowdown Heat Recovery System can recover up to 90% of the heat energy that would otherwise be wasted. The recovered heat is used to pre-heat boiler make-up water before it enters the deaerator and for low pressure steam to heat water inside the deaerator, which reduces the cost to run the deaerator and improves overall boiler efficiency. Reducing the temperature of the blowdown before its disposal is a typical Code requirement. Therefore, a heat recovery system also eliminates the need to dilute blowdown with cold water before its disposal. Sterling’s Blowdown Heat Recovery System offers an attractive payback, depending on blowdown volume. Several boilers can be connected to a single heat recovery unit, reducing capital costs. Typical payback is under 12 months.